One of my earliest compilations of music based on one mind-numbing theme. Hence the graphic design that is more amateurish than my current level of amateurism. 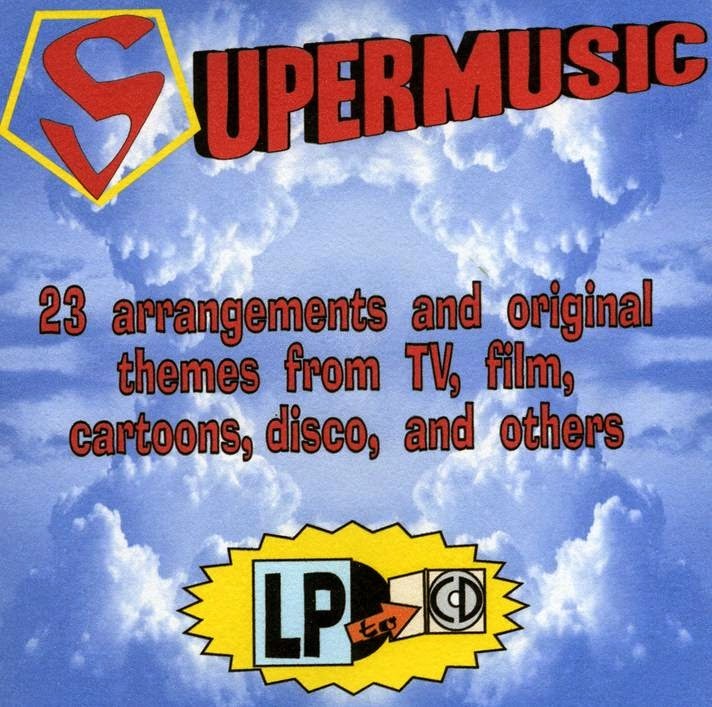 Some versions of the "Superman" themes, and a few songs ABOUT our favorite Kryptonian. Some of them are pretty bumpin' as in Track One. Yes, the actual cassette labeling for Track Five is "Sound from Krypto," not Krypton. Also I think the speaking voice sounds a little like a Robin Williams impersonation. Well, I'll be a three-eyed Kryptonian Babootch! NOTE: This review is going to be heavy on quotations so you can try and understand the author’s hard-to-summarize ideas. All numerals in parentheses refer to page numbers in this edition. This fairly obscure book is either paranoia masquerading as dispassionate Systems Analysis, or the depiction of a Systems Analysts’ descent into paranoia. Perhaps both at once. Fox says that he received the present MS on June 20, 1973. The author’s name was given as Thibaut D’Amiens. The cover letter modestly informed Fox that this book “may be the most important book written since the New Testament” (5). Even though Fox was at this time a publisher of poetry and not political tomes or sociological works, D’Amiens flattered him with the suggestion that perhaps Fox’s unorthodox (that is, “artistic”) temperament might make him more likely to have an open mind and consider the validity of D’Amiens’ thesis. In turn, Fox tells us that, if that thesis “is true in any way” (5), then it PROBABLY IS as important as the author’s claim. The thesis, by the way, is that there are unknown powers behind the scenes of the world, making things turn out the way they want. I guess editor Fox’s artistic stance must have insulated him from a predominant feature -- paranoia in modern culture -- for, I don’t know … THE LAST 100 YEARS OR SO!!! Then Fox explains how he deduced that Borishinski was a Hungarian émigré, but that’s about as far as Fox’s investigations could get. The closing of this Introduction sets the stage, and also shows Fox’s total buy-in to the Mysterious Powers idea. 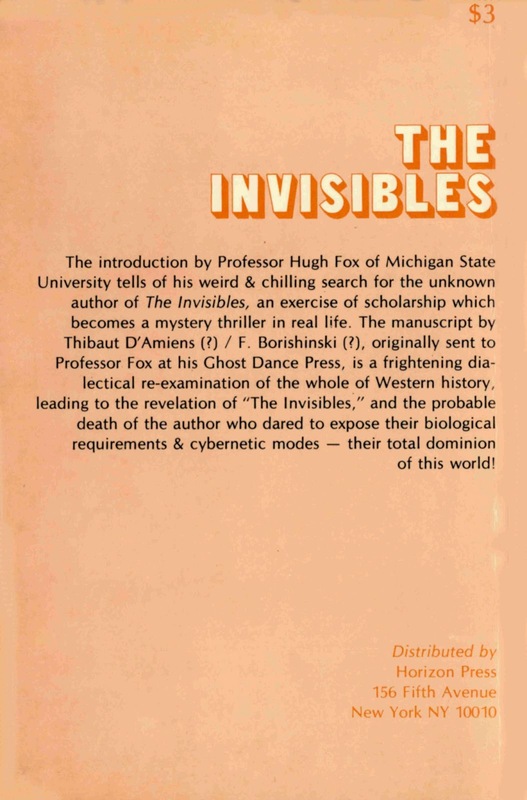 “The Invisibles,” as D’Amiens named them in 1973, are “beyond good and evil -- to them, the Human Race, this planet, are peripheral contingencies subordinated to THEIR own master plan” (15). The book is divided into 23 subdivisions with subtitles. They aren’t numbered, but I’m going to enumerate them, first by page number and then by which section it is. 16 - ONE: MY FIRST ENCOUNTER WITH SYSTEMS ANALYSIS. Here, D’Amiens describes just that. SA, he explains, is the breaking down of problems into various components. From there, you examine the branching options of different proposals to solve bits of the overall problem. Mucho más details here. D’Amiens continues, “Nothing was permanent, everything was variable … and what was more, all factors seemed capable of being isolated and analyzed”(17 -- ellipsis in original). 18 - TWO: SYSTEMS ANAYLSIS AS APPLIED TO SOCIO-ECONOMIC STRUCTURES. D’Amiens says that SA could easily be applied to people. “We the people, in other words, can be manipulated by changing any of the well-being coordinates in our lives” (22). Well, duh -- a change in your life can change your life. Brilliant, Holmes! 26 - FOUR: THE HISS-CHAMBERLAIN-NIXON CASE: THE PATH TOWARD THE INVISIBLES. This episode in recent American history, with its accusations and cross-accusations of treason and disappearing-reappearing evidence, is given as an example of double-think and the idea that one surface intent may mask a deeper cross-intent. 31 - FIVE: A SYSTEMS ANALYTICAL LONG-VIEW. This explains why D’Amiens chose the Hiss case as an example. Perhaps the US’s Red Scare was planned by the Reds, “ …a much larger Systems Analysis Schemata that seems to point to some kind of Soviet Masterplan to subvert American (Western) institutions from within” (34). In other words, maybe Nixon was catapulted to national prominence as a Commie-hater because the Commies intentionally gave him some Commies to catch! 35 - SIX: IDENTIFICALNESS OF GAME-SETS. Yes, that’s how it is spelled in the book. D’Amiens echoes many other writes who state that JFK’s position of power as US President made him a threat to other powerful folks because he played by different rules, or perhaps even played a different game. “Although the game Set had not essentially changed between the late forties and early sixties, however, one important Player was not playing according to the already pre-established, by now almost ‘traditional’ rules: JFK” (35). As mentioned, other writers have described how President Kennedy riled plenty of “Establishment” types by moving towards a live-and-let-live stance vis-à-vis the USSR. In other words, JFK was a heretic to the Gospel of the First Strike. “The Cold War was slowly becoming at least a lukewarm peace. The whole Kennedy impulse was toward disarmament, international aid and mutual cooperation … and a reorientation of the economy toward reasonable moderately profitable peaceful production, away from BOOM TIMES (which always presage Depression) into NORMALCY again” (39 -- ellipsis in original). 39 - SEVEN: INVISIBLE LINKS IN VISIBLE CHAINS: So, basically, JFK was doomed because the Powers figured that without the super-commerce generated by a semiconstant war economy, the country (and the Powers’ bottom line) would flag. Kennedy apparently would not dance to the War Machine’s song. 41 - EIGHT: THE GAME PLAN CALLED COUNTER-REALITY. This section begins by describing CIA-level smokescreens, and recounting the now-famous and instructive WWII deception “The Man Who Never Was.” D’Amiens goes on to say “ … It is rather easy to see how game models could be used to create an Assassination Game with a series of built-in decoys and false-leads that would lead investigators away from instead of toward the Counter-Reality that created the Game in the first place” (42). 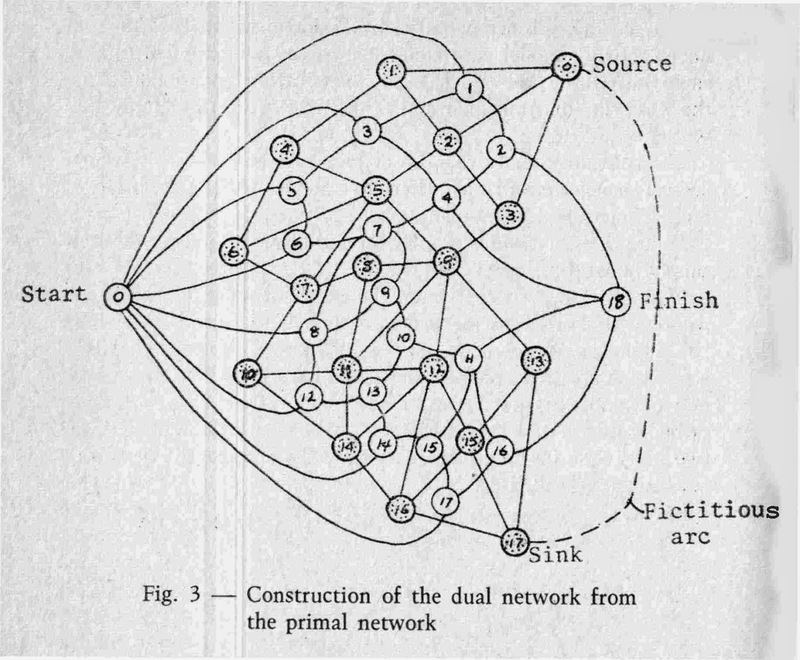 Figure 1 is “a hypothetical supply network” shown on page 43. “Source” = Assassin(s). “Sink”=Victim(s). 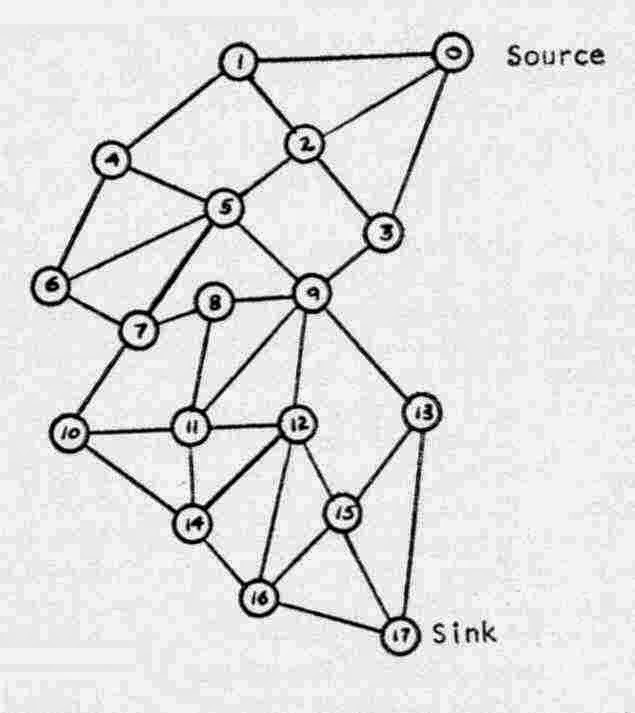 These steps, or nodes, are the actual increments or steps taken by whoever was truly behind the death of JFK. The real behind-the-scenes doings, whatever they are … not the Establishment’s Lone-Nut-Oswald theory. Figure 3a is figure 1 with a secondary node-system overlaid -- the original intermediary nodes are left white. “ … By drawing arcs connecting the secondary system THESE ARCS ALL CROSS ONE OF THE PRIMARY ARCS” (44), sidetracking any investigators. In fact, D’Amiens says a bit further on, this is EXACTLY WHAT HAPPENED to New Orleans DA Jim Garrison’s case. A counter-set of clues can be laid, leading to confusing or even contradictory dead ends. “When any attempt is made to trace connections back away from the assassin through the secondary nodal system, each possible connection is intercepted by the primal network so that not only does the investigator become lost in the maze of the secondary system, but never realizes that it is a secondary system with oblique manipulative connections that can never be followed back to the Master-Planner” (45) -- represented by the “O,” labeled “Start,” at the left edge of Figure 3a. These secondary bits of information, the “false leads,” are the DARK DOTS on the diagram. If you were talking about the Warren Commission’s theory of the JFK assassination, then these intersection points might be labeled “job at Depository” -- “mail-order rifle” -- “Cuban sympathies” -- “Russian defector” -- “fake ID in wallet” and so on. 45 - NINE: TEMPORARY POINTS OF VISIBLE INTERSECTION BETWEEN THE PRIMARY AND SECONDARY NETWORKS? In D’Amiens’ view, an example of such a false lead might be the Dallas Police car that pulled up outside Oswald’s room while he was in there after the assassination, which tooted its horn several times. This could have been a whole-cloth red herring (to mix metaphors), a cop told to pull up to this intersection and honk a few times, and then leave. He would never know why, and if he ever figured out his stop in relation to Oswald’s whereabouts, he would keep his trap shut forever for fear of being innocently dragged into the mess. However, such an “important clue” could provide almost an endless diversion of resources and time. “Presumably, then, we have a REAL task-force doing the killing, decoying the police away from themselves and directing them in on Oswald (by radio), and a whole almost magical DECOY task-force, led by Oswald who, up until the time of his apprehension was really unaware he was a decoy” (46-47). Remember how LHO maintained that he was “just a patsy”? “Then, once the Kill has been effected and the Patsy has been caught, all ‘surfacing’ stops. the links between the Visible and Invisible disappear … and the maze of misdirection, hints, clues, rumours that surround the very visible Oswald is surfaced” (47-- -- ellipsis in original). 47 - TEN: INSIDE THE MAZE. 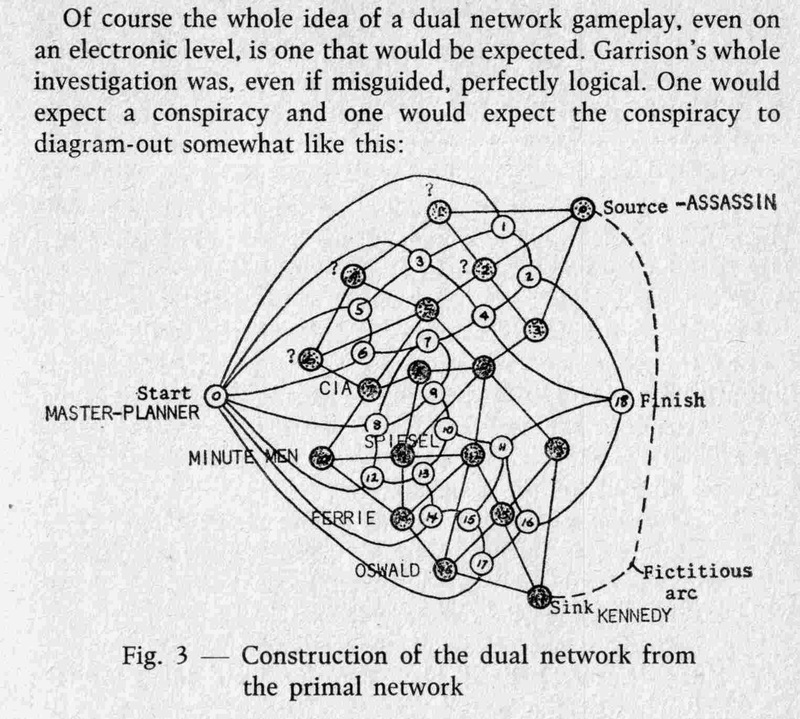 This section shows how Jim Garrison’s 1966-1969 investigations fell into just such a mine-laden network of false clues. Figure 3b has our previous diagram labeled with some of the objects of Garrison’s inquiries. As evidence that Sirhan’s mind had been messed with, D’Amiens notes several times when Sirhan gave contradictory opinions of Bobby Kennedy: “ … a mass murderer … I really liked him” (52). Now, this kind of behavior (and Oswald’s mysterious silences under DPD questioning) can be indicative of posthypnotic conditioning. D’Amiens points out that this sort of thing didn’t even become a public idea until much later. This statement is incorrect. Richard Condon’s The Manchurian Candidate was published in 1959, and the film of the same name was released in 1962. Perhaps D’Amiens intends to say that people “of the right sort” certainly did not think that such things happened “in real life.” For instance, nobody in the 1960s (or 1976, when this book was published) knew about the CIA’s mind control program, MKUltra. As D’Amiens says, “No nets or webs on the purely post-hypnotic suggestion level were ever even postulated. The Invisibles had moved their technology into a New Age that was at the same time as old as the occult itself -- only no one in the Old Age was as yet prepared to follow them” (53). 53 - ELEVEN: “MENTAL HOSPITAL” AS ASSASSIN-FACTORY. This section suggests that not only Sirhan and Oswald displayed evidence of programming, but also LHO’s killer Jack Ruby. 58 - TWELVE: INVISIBALISM [sic] AND THE SUPRANATIONAL. Here D’Amiens explains that the trail of deceit leads a bifurcated path to both the USSR and “U.S. Super-Businesses” (58). Wait a minute! he says. These are not really enemies at all -- they’re partners. Both of these macro-entities stay in power -- and locked in eternal competition --, he maintains, due to the arms race. “In terms of theoretical economic-growth models, then, the Soviet Union and the Satellite Countries become -- in an absolute economic sense -- a supranational company pitted against the Western Bloc countries which together form (as a business/governmental unit) a second, rival supranational company with the same productive-growth aims and aspirations” (62). 62 - THIRTEEN: THE COMON -- AND THE INVISIBLE -- WEALS. This section talks about financial theory, specifically a Keynesian doctrine advocating government “stimulus” of a nation’s economy, by giving government money, whether by taxation or creation-by-fiat, for public projects. This would continue regardless of the effects on the economy. “Inflation”? No problem! “Defense spending is even less affected by inflation because it bypasses aggregate demand as such and goes directly to the ‘nation’ as consumer. On the level of defense-spending the common weal of the Worker as such is not only blithely ignorable, but given a framework of continued deficit spending, there need be no reference back to the ‘real’ overall national economic climate” (66-67). From here to the end, D’Amiens follows this idea, that governments and corporations follow aims that are independent of the good of society. In fact, he observes with horror, some apparent goals of the Invisibles are pursued in spite of the cost to human life, or any continued organic life on Earth. 67 - FOURTEEN: CORP ORG-THINK AND THE NEEDS OF SPACESHIP EARTH. “In the supramoral world of CORP ORG-THINK there are not people, but merely Consumers, no social inequities but merely Solvent or Insolvent Market Areas, no Planet Earth, but merely Market Space” (68). “The planetary logistics of the Invisibles, operating through the supramoral data-banks of a planetary CORP ORG is to: 1. Exhaust this planet and then 2. Leave Earth behind in a space-program designed to find new energy-sources not merely within our solar-system, but far, far beyond. The overthrust of the Invisibles’ Master Plan is to destroy this planet with its own resources and then simply … more on …” (69 -- ellipsis in original). 69 - FIFTEEN: DÉTENTE AND ENERGY VAMPIRISM. The idea of détente, or de-escalation is, according to D’Amiens, by its very nature antithetical to the Invisibles’ plans. “The Invisibles, in a planetary context, are ENERGY-Vampires. … This move toward SPACE as a LIVING ENVIRONMENT can be correlated with the despoiling of planetary air-water life-support systems if we postulate that the INVISIBLES IN NO WAY DEPEND ON WHAT WE CONSIDER TO BE SURVIVAL CONDITIONS FOR THEIR OWN SURVIVAL” (70). 70 - SIXTEEN: THE ALMOST-INVISIBLES: ON THE THRESHOLD OF INVISIBILITY. This section sums up what D’Amiens has sketched so far: An unseen conglomeration of power-holders sows discord to gain and keep control, regardless of the toll on people and planet. His next deduction from these observations is that either these rich guys “must as a group be controlled by a higher power” (74) -- or -- that they “are not terrestrial at all but merely extra-terrestrials who have assumed human form as merely one stage in an inter-galactic mission whose purposes remain totally unknown to us” (74). 74 - SEVENTEEN: THE ORIGINS OF CORP-ORG THINK: THE PARADIGM OF IMBALANCE. Present Western civilization is, D’Amiens asserts, a perfect conduit for the Invisibles’ scheme. 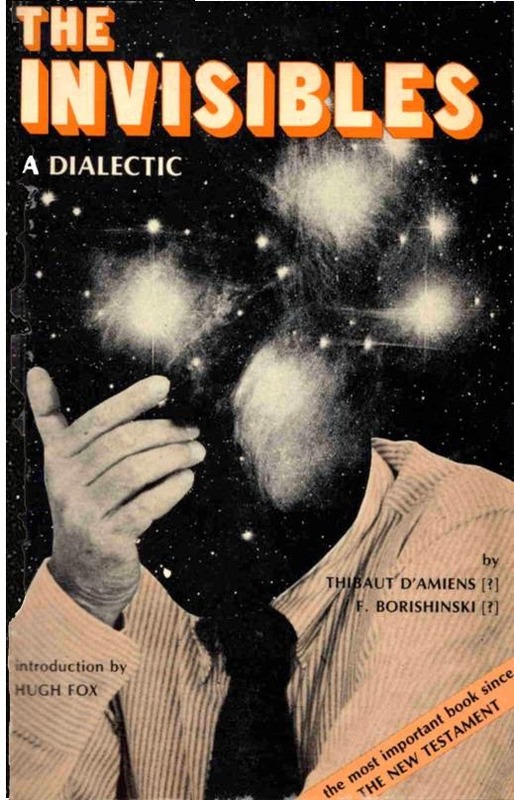 “The Invisibles, hiding behind the visible White Man Power Structure, having no color themselves, become partially incarnate in White Form, so that although their essential nature remains ‘transparent,’ they are at least seen and represented by Whiteness -- the visible Symbol (on a worldwide scale) for Invisible Divinity” (78). 79 - EIGHTEEN: THE ENEMY OF CAPITALISM. Here D’Amiens enumerates some “industries” kept financially afloat, he says, by racial unrest: Black-Is-Beautiful Industry; sales of self-defense/police gear; New Living-Enclave Industry (such as the boom in gated “communities”); and the Integration Industry, which supports busing, Head Start and other training programs. All this is designed so that such activities will keep consumers spending, flowing money through the Invisibles’ agents’ hands. “Ideally, in terms of Corporate Goals the Black-White confrontation in the U.S. should be maintained in a state of instability, liquidity, high-surface-tension, not being allowed to swing over into real revolution and at the same time never really be resolved. It may seem too cynical for me to observe this, but: If everybody DID manage to finally get along better, it would put a lot of people out of work. There are plenty of folks who make “good” money from race-baiting and from encouraging other people to take offense where none was intended. While there are plenty of despicable people out there -- some of whom are racists -- not every wrongful act is race-related. There are mean people in EVERY mode of life and society. On the other hand, you cannot argue with D’Amiens’ observation that without continued conflict, professional “conflict resolution” people would have to get a different job! “Drug Addiction paralyzes political organization, maintains in-group alienation, encourages a self-isolating turning inward, blocks group-think, group-act, any type of large-scale group-identity buildup. At the same time it maintains Apartheid and the whole complex Apartheid Industry, and keeps the black in a COLONIAL POSITION WITHIN THE U.S. ITSELF SO THAT WHITE AMERICA BECOMES THE MANUFACTURING-SUPPLIER TO ITS OWN BLACK COLONIAL POPULATION” (87). 88 - TWENTY: POSITIVE AND NEGATIVE GOLD-FLOWS: THE OVER-ECONOMICS OF THE INVISIBLES. This section discusses how drugs flow wealth into the more recently industrialized Orient. This is all to finance the maximum number of development tracks that might lead to a way off this lousy planet for the Invisibles. “In a sense, then, the INVISIBLES are supporting the Red Chinese, the Soviets AND the U.S. … encouraging all three space-programmed countries with the objective of UTILIZING THE FIRST AND THE BEST OF THE THREE OVERALL PROGRAMS FOR THEIR OWN ESCAPE PURPOSES!” (90). This sounds rather dated now, doesn’t it? I mean, nowadays the good ol’ USA has to depend on Russia to give our astronauts a lift into orbit! Was there a secret launch of Invisible folks that we missed documenting? Of course, even if the Invisibles left, their “orgs,” systems, and human agents would remain in place, with a vested interest in maintaining THEIR OWN power. 90 - TWENTY-ONE: THE PROFIT-MAKING COVERUP: THE PILOT FISH TECHNIQUE. This section can be summed up with this sentence: “It would seem, then, that the war in S.E. Asia is but a continuation of a definite U.S. business-government trend initiated some eighty or ninety years ago -- THE USE OF WAR TO EXPAND EXISTING MARKETS (RESOURCE POOLS) AND CREATE NEW ONES” (92). Of course, this only applies so long as conflict remains fairly small-scale. D’Amiens might say that the reason we haven’t had a nuclear war is that such a mess wouldn’t make economic sense for the Invisibles! 94 - TWENTY-TWO: PROGRAM AND PROGRAMMER: THE AUTONOMY OF AUTOMATA. This section confuses me some. But I think D’Amiens’ main drift is that, even with all the aforementioned “control” programs in place, humans are a messy and inconsistent lot. A desired stage would be “TOTAL CONSUMER CONTROL, WHEREBY THE CONSUMER IS NOT GIVEN A CHOICE OF PRODUCTS/LIFE-STYLE, BUT HIS ENTIRE ENVIRONMENT IS DETERMINED BY PRODUCT CONTROL THAT SERVES MERELY TO MAINTAIN HIS STATUS AS A CONSUMER WITHOUT ANY REFERENCE TO HIS PHYSICAL, PSYCHOLOGICAL OR MORAL GOOD” (97). Actually, that sounds a lot like Madison Avenue on some of its more mercenary days! In other words, as stated previously, all of this wealth and power were accumulated solely to raise human technology to a point that the Invisibles can leave Earth. We’ve reached the point that many things can be done by apps and computer-controlled devices. “Now they merely wait until the MEGAMCHINE MANIPULATES PLANETARY DYNAMICS TO THE COMPLETION OF ITS LAST ‘PROJECT’ -- PROJECT EARTH-ESCAPE” (99). 100 - TWENTY-THREE: THE NIGHTMARE OF CENTER CONTROL I: A PERSONAL CONFESSION. Here D’Amiens wraps things up by recounting the stages of his awareness/paranoia concerning the Invisible and their agenda. It began when he noticed a few strange connections in society that led to the inklings of the beginnings of his present “catch-all” theory of the Invisibles. “ … Slowly I became aware of a PRESENCE, A FORCE WATCHING ME AND WHAT I WAS DOING … AND THE CLOSER I CAME TO THEIR SYSTEM, THE STRONGER THE SENSE OF BEING IMPEDED CAME” (100 -- ellipsis in original). In D’Amiens’ case, the locale seemed to be like Ozymandias’ arctic retreat Karnak in Watchmen, a huge room filled with video displays of mystifying content. Eventually D’Amiens lost consciousness and woke up in bed, asking his wife to get him to a hospital. Now he says that, given what he knows, he can’t figure out why he’s still around to spill the Cosmic Beans. The suspense is driving him crazy (!). “Has the whole history of Man on Earth been merely a sub-plot of some larger cosmic drama?” (104). He theorizes that “the complete lack of any appearances by ‘God’ in the last five hundred plus years” (104) means that divine intervention in human society might be unnecessary, now that technology can take up the slack of running the show of human consciousness. I don’t know whence this theory, since many folks will concur that God is not silent, even nowadays. This book of mixed mania and insight ends on a most Lovecraftian note. “If anyone holds this book in his hands, and reads it, be sure the so-called DAY OF JUDGMENT IS AT HAND, THE SECOND AND LAST COMING … PRAY TO THE INVISIBLES THAT YOU MAY BE SAVED, INCLUDED IN THEIR FIRST AND FINAL INTER-GALACTIC ARK!” (105-- ellipsis in original). -- Well, gentle reader, what do you think? Is this book deservedly semi-obscure? I have gone into such depths because I haven’t seen any other review or summary or ANYTHING online about this book. You can find it listed for sale, but there is little clue as to its content. Now I hope you can chew on some of these ideas and decide for yourself. Personally the section about the trails of false clues in the Kennedy killings seems very plausible. Here’s another valid point. If as D’Amiens says, all trails that “lead upward” are salted with fake clues and false leads, then why should he (or we) have any assurance that he has tracked the CORRECT bread-crumb trail? ’Tis a puzzlement that one can relish considering, without expecting to solve it. Have YOU any ideas or comments to share?